It is huge…a military campaign larger than anything the nation has ever seen. Maj. Gen. George B. McClellan’s brainchild, the Peninsula Campaign, is getting underway. Instead of a straight-forward push southward from the Washington area via Manassas, to the Confederate capital of Richmond, McClellan has come up with the idea of circling around by water, then driving northwest to attack Richmond on its flank. Right away, Confederate Gen. Joseph E. Johnston got things off to a bad start for McClellan. Johnston simply took his army out of Manassas and repositioned it to block McClellan’s approach from the southwest. So much for the flanking move. But enormous projects acquire a momentum of their own, and the Peninsula Campaign was going to go forward, no matter what. President Lincoln had misgivings about it, but finally swallowed his objections. He shouldn’t have. Lincoln the amateur military strategist was wiser than McClellan the professional soldier. McClellan’s Army of the Potomac has more than 100,000 men, 25,000 horses and mules, and 300 cannon. To move it down the Potomac Rive r and Chesapeake to Fort Monroe at the tip of the peninsula formed by the James and York rivers. Montgomery Meigs has rounded up 400 ships and barges to transport this enormous force. Slowly, ponderously, this gigantic force is in motion today. In the Confederate capital, there is anxiety over an enemy force that looks well-nigh unstoppable. ELSEWHERE IN THE CIVIL WAR: In the Shenandoah Valley, Stonewall Jackson retreats southward, pressed by a newly reinforced Federal force under Nathaniel Banks. On the Tennessee River, Federal gunboats advance up the river, pass Eastport, Mississippi, and go as far as Chickasaw, Alabama. Everywhere there is bad news for the Confederacy. Across the continent, east and west, major armies are poised for action. There is no serious fighting anywhere, however. It is as if a hush has fallen over the land, Federals and Confederates alike waiting with breathless anticipation. Slowly, pieces are falling into place for a cataclysmic event in southwestern Tennessee. Arrayed near the Tennessee River, both sides are expecting something to happen, and soon, but neither has any idea how terrible that something will be. Maj. Gen. Ulysses S. Grant is consolidating his forces at Pittsburg Landing. Originally scattered along six or seven miles of the Tennessee River, from Savannah to Pittsburg Landing, most of the troops are settling down on together at Pittsburg Landing. Today, he announces that his headquarters will move from Savannah to Pittsburg Landing (although he will return to Savannah by his personal packet boat each night, where he has established his personal billet in the Cherry mansion). Camped on the river’s west bank and spread across Pittsburg Landing’s nine-square-mile plateau of rolling brushland and small farms, are 34,500 men, plus 7,500 noncombatants, such as teamsters and cooks. The troops include Brig. Gen. William Tecumseh Sherman’s 5th Division of about 8,500, mostly from Ohio and mostly untested; Brig. Gen. Stephen A. Hurlbut’s 4th Division of 6,500, largely from Illinois; Maj. Gen. Charles F. Smith’s—but, very soon, due to Smith’s sickness—Brig. Gen. W. H. L. Wallace’s 2nd Division of 8,500, largely from Iowa, IIlinois, and Missouri. 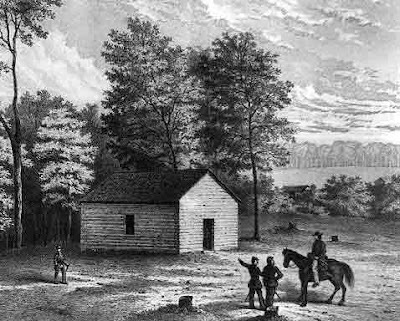 About two miles inland from the river, Sherman’s men were arrayed near the small, crude meeting house called Shiloh (pictured above), and Sherman’s own tent is only a short distance from it. Also here are Maj. Gen. John A. McClernand’s 5th Division of 7,000 veterans, drawn almost entirely from Illinois and battle-tested at Fort Donelson, and Brig. Gen. Benjamin M. Prentiss’s newly created 6th Division of 4,000 men drawn from eight different states. Over the next few days, still more troops will arrive, swelling the force at Pittsburg Landing to 45,000. Brig. Gen.Lew Wallace’s 3rd Division of largely Ohio men, however, remains isolated at Crump’s Landing, diagonally across the river from Savannah and about five miles downriver from Pittsburg Landing. Meanwhile, twenty-two miles southwest, also west of the river, and across the state line in Mississippi, the Confederacy’s Army of Mississippi is assembling. It counts about 40,000 men, and is divided into three crops, plus one “reserve.” Commanding the four are, respectively, Maj. Gen. Leonidas Polk (who is also an Episcopal bishop), Maj. Gen. Braxton Bragg (so toxic a personality that his own soldiers had tried to kill him during the Mexican War), Maj. Gen. William J. Hardee (known through the pre-war army for his book on tactics), and Maj. Gen. George B. Crittenden (who will be replaced within a few days by Maj. Gen. John C. Breckenridge, formerly a U.S. senator and vice president). In overall command is Maj. Gen. Albert Sidney Johnston, a favorite of CSA President Jefferson Davis. Johnston, however, is currently the object of scorn from many Confederates for his withdrawal from Nashville without fighting. Next to Johnston in overall authority is Maj. Gen. P.G.T. Beauregard (“The Little Creole”). It is thought that much of the actual decision making at Corinth is Beauregard’s. Large numbers of soldiers on both sides are sick, thanks to dirty water and poor sanitation. Those who are well pass the time brushing off the buzzing flies while reading or playing cards. Meanwhile, Grant is waiting for Buell’s reinforcement to arrive before attacking Corinth. Unbeknownst to him, the Confederates are hoping to strike a fatal blow before Buell arrives. The peach trees are blossoming and all is calm. Maj. Gen. Ulysses S. Grant, in his headquarters at Savannah, Tennessee, writes “Dear Julia” today. About two-thirds of Union soldier deaths in the Civil War will be from disease, not wounds. Illness—most of all, from typhoid—will strike everyone from the highest commander to the lowest private. In time, even those living in the White House will discover they are not exempt. This quiet, self-effacing, almost meek and congenitally honest little man (ordinarily, he weighs about 135 pounds and is about 5’7” tall) is, under the skin, a ferocious fighter and neither disease nor the Confederates are going to defeat him. He just doesn’t think that way. Throughout the war, close observers—most of all William Tecumseh Sherman—will try to figure out what gives Grant his extraordinary powers. Sherman will conclude there is a deep well of extraordinary confidence—optimism, even—hidden inside this man. You can’t rattle him, and he never gives up. Grant concludes today’s letter with a detailed explanation of his recent suspension from command, by Halleck. Grant notes that some in the eastern press have written hurtful speculation about the cause, none of it true. But even in this Grant is optimistic. “You need not fear but what I will come out triumphantly. I am pulling no wires, as political generals do, to advance myself. I have no future ambition. “My object is to carry on my part of this war successfully and I am perfectly willing that others may make all the glory they can out of it. Oh, for more commanders like Grant! Along the Tennessee River a few miles north of the Tennessee-Mississippi line, Maj. Gen. Ulysses S. Grant is struggling with one of the realities of the Civil War: most of the Union armies are filled, not with professional soldiers, but civilians in uniform. What this meant, according to the late historian Bruce Catton, was that discipline in volunteer units could never rise to the level of the regular army. Men followed officers they respected, not because their leaders wore shoulder straps. A prominent German general said the American Civil War did not merit study because (as Catton put it) “it had been fought by armed mobs.” Some West Pointers won respect and succeeded as leaders; some did not, and failed, despite their professional training. They simply couldn’t adjust to the more relaxed discipline required to lead volunteers. On the other hand, many volunteer officers had no prior military training, but these lawyers, businessmen, and professors became respected leaders if they did two things: (1) were fearless in battle, and (2) treated their men fairly. And fraternization between officers and their men was common. After all, they often came from the same town. While Grant waits at Savannah to move against the Confederates camped at Corinth, Mississippi, he spends much of today trying to clamp down on unauthorized furloughs. A steady stream of soldiers has been traveling down the river on leaves granted by their company officers. Grant’s superior, Major General Halleck in St. Louis, has gotten on Grant’s case, and Grant feebly protests—in two separate letters today—that he is doing the best he can. Sometimes it seems as if a battle would be a welcome relief. As Catton points out, however, what happened in the Civil War is what has happened in most wars fought by Americans: most of the fighting was done by men (and, more recently, women) who mostly come from civilian life and return to it after the conflict is over. The American soldier “never really becomes very military; for better or worse, he remains to the end a citizen in arms,” said Catton. A slow day. There’s no combat, aside from those never-ending flashes here and there of pickets and scouts popping off at each other. In Washington, President Lincoln visits the Navy Yard. In Tennessee, Federal reconnaissance missions crisscross Tennessee, which is beginning to slip away from the Confederates. In southwestern Tennessee, Grant is still thinking about a pre-emptive strike against the Confederate forces gathering a few miles away at Corinth, Mississippi. He is wondering where Buell’s reinforcements are. Buell’s Army of the Ohio is moving ever so slowly in Grant’s direction. In St. Louis, the ever-anxious Maj. Gen. Henry W. Halleck is trying to savor his expanded span of control, which is most troops west of the Appalachians. He, too, worries. Among forces on both sides there’s a sense that something is going to happen—but when? And how? The snow will end by Thursday, and then the deep mud season will begin. More delays, more tedium. The desperate search for something—anything—to enliven the day as a subject for conversation and letter writing. Fortunately, regimental surgeon Dr. Joseph T. Webb, Lucy’s brother and Rutherford’s brother-in-law, brings back a good story, one that will probably be told and re-told to the accompaniment of much thigh slapping. And that, for several days, was the high point of life in the mountains for Colonel Hayes. 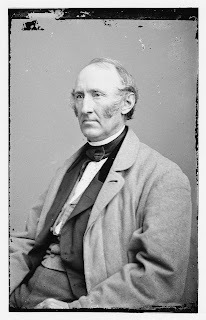 Wendell Phillips (pictured here) is a well-born Bostonian of wealth, intellect, and charm whose ability to sway an audience has earned him the nickname, “The Golden Trumpet.” He also is an inflammatory, near-fanatical opponent of slavery. It is a dangerous combination. In 1862, Cincinnati is the fifth largest city among all the states, Union and Confederate, and a hodgepodge of Northern and Southern flavors. Perched across the Ohio River from Covington, Kentucky, Cincinnati—the “Queen City of the West”—was, before the war, an important trading and communications center for both the South and the North. It is populated by rabid abolitionists, Underground Railroad operatives, Confederate sympathizers, and free blacks with ugly memories of slavery. On this Monday evening, Phillips is at the Opera House in Cincinnati to give one of his barn-burner public lectures. Wasting no time, he loudly proclaims himself an abolitionist, which prompts hissing from the galleries (balconies) and, worse, eggs and stones, some of which hit him. Each time the hissing dies down and the projectiles cease falling, Phillips is off and running again, practically daring the audience to disagree with him. There are three successive cycles of verbal provocation greeted by hisses, eggs, and stones. The angry crowd then rushes down the stairs to the main floor and moves up the middle aisle towards the stage. There they are met by Phillips’ friends and a general brawl breaks out—fists flying, ladies screaming, chairs falling. By 10 p.m., Phillips’ friends have spirited him away. His detractors roam the streets, looking for him without success. Fortunately, “no one was seriously hurt as [far] as we can learn,” the Times reports. ELSEWHERE IN THE CIVIL WAR: Still leery of freeing America’s slaves unilaterally, Congress and President Lincoln are both pondering the possibility of compensated emancipation, in which slave owners would be reimbursed in some way for freeing their slaves. The idea is a pipe dream—few slave owners and Southern politicians would find it attractive—and it will fade away. Jackson cannot halt the retreat, and so it seemed as if the Union has won the day. But this seeming loss will prove a boon to the Confederates. Alarmed at Jackson’s fierceness and assuming his forces were stronger than they are, the Union war managers make several panicky mistakes. Troops that could bolster McClellan in his Peninsula Campaign or crush Jackson in the Valley were diverted elsewhere, most of all to the protection of Washington. At his field headquarters in Savannah, Tennessee, Maj. Gen. Ulysses S. Grant, commander of what will come to be known as the “Army of the Tennessee,” is waiting for muddy roads to dry up before attacking the Confederates gathering less than 30 miles away in Corinth, Mississippi. He decides to write Julia again. He wrote her yesterday, too, but things are slow, so he has the time to do it and besides, he likes writing to Julia. There’s another reason: Julia and the four Grant children—ages 4 to 11—have been staying with his family in Covington, Kentucky (just across the river from Cincinnati). They have not been enjoying it. “I see plainly from your letter that will be impossible for you to stay in Covington,” Ulys writes Julia. “Such unmitigated meanness as is shown by the girls makes me ashamed of them. You may go to Columbus and board or to Galena and keep house. Grant’s parents originally had had seven children: three brothers (one of whom died last year) and three sisters. Two or three of the sisters are tormenting Julia, the sorest point being the paying of board, to Grant’s parents, for the Grant children. Apparently, the sisters think Julia should be paying more, and have not hesitated to make an issue of it. Stunned by this lack of familial generosity, Grant tells Julia, “I could not raise my head again” if he were even to ask one sister to pay board to him, were it needed. Ulys concludes to Julia, “You had best leave at once for some place. Tell them [his sisters] I direct it and the reason why. It always helps to have friends in high places, and the United States Army’s generals in the Civil War were no exception to the rule. Nor should the danger from enemies in high place be underestimated. Maj. Gen. George B. McClellan made the mistake of thinking Secretary of War Edwin M. Stanton was a friend—an illusion the dissembling Stanton did nothing to dispel. Meanwhile, Stanton was dissecting McClellan in secret conferences with McClellan’s critics in Congress. Stanton took office in January 1862; by March, McClellan had lost his title as general-in-chief of all the armies, and by November he would be removed from all command. President Lincoln, who was perfectly capable of making up his own mind, made the final decision in both cases, but his thinking certainly was encouraged by Stanton. Other generals, such as Don Carlos Buell and William S. Rosecrans, made the mistake of getting crossways with Washington with no advocate to plead their case. They, too, would pay the price. On the other hand, Ulysses S. Grant, by nature one of the most straight-forward and least political of men, repeatedly benefitted from the influence of Congressman Elihu B. Washburne of Illinois (pictured above). Both Grant and Washburne lived in Galena, Illinois, at the outbreak of the Civil War. 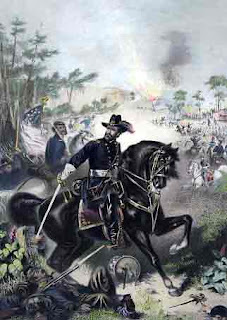 Grant initially avoided special help in finding a longed-for appointment to command, but, unable to secure a place, he finally acceded to Washburne’s assistance. Discovering that Grant had military experience, the Congressman requested his appointment as colonel of the 21st Illinois Volunteer Infantry, and by July, Grant—in well-worn civvies, lacking a uniform—took command of the fractious regiment and soon tamed it. And the rest is history. Fortunately, the military command and political systems of the time (fortified by the wisdom of Lincoln and Stanton) allowed talent to trump political influence. The meritorious cream often rose to the top, as Grant’s performance will stunningly demonstrate. 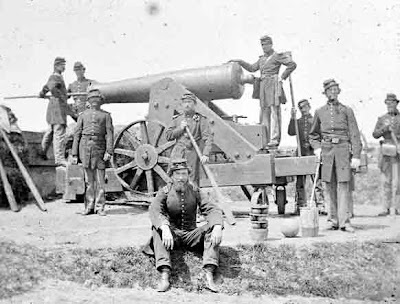 But Washburne’s help was always useful, when, for example, Grant’s forces needed better weapons, more manpower, or a well-earned promotion here and there. There will be more letters, and Washburne will not be disappointed. Until today, Stonewall Jackson’s Confederates have been retreating in the Shenandoah Valley, pursued most recently by Federals under Brig. Gen. James Shields. Born in Ireland, Shields is a man of many talents, but military command is not one of them. Moreover, whatever luck he brought with him from Ireland is going to run out, for Union strength in the Valley has just been reduced. Shields’ ally (and superior) had been Brig. Gen. Nathaniel P. Banks, a daring but inept commander from Massachusetts. Banks’ assignment had been to drive Jackson from the Valley. When a cavalry report about Jackson’s location reached him, he concluded, “Mission accomplished,” and headed eastward, out of the Valley, to begin a new mission, that of shielding Washington from attack. But the cavalry report was wrong: Jackson hadn’t fled the valley at all, and the tables were about to turn. Jackson’s retreats in the Valley had merely been strategic. Today he begins pushing back and it is the Federals’ turn, under Shields, to begin retreating. One of the most brilliant campaigns of the war—“Jackson’s Shenandoah Valley Campaign”—is about to unfold. Grant thinks he will be ready to launch such an expedition in three or four days. In the meantime, however, Confederate troops are pouring into Corinth. Although most of Albert Sidney Johnston’s arm, which is coming from Murfreesboro, is stretched across northern Alabama and Mississippi, two brigades have arrived to join Beauregard’s men who are already there. Barely, just barely, you can feel nerves beginning to tingle, all the way from Maj. Gen. Henry W. Halleck’s command post at St. Louis, Missouri, to Ulysses S. Grant’s Tennessee River expedition headquarters at Savannah, Tennessee. Something big—“a big lick,” as Grant calls it—is going to happen, although no one knows when or exactly where. But it almost certainly is going to happen somewhere in this poor, swampy land of creeks, cornfields, and small farms in western Tennessee, just north of the Tennessee-Mississippi border. Grant has proven, at Fort Donelson, to be an aggressive commander who moved faster than Halleck might have wished. Probably the ever-cautious Halleck is worried Grant might slip the leash again. But Grant is trying to be careful and he admits something about himself when he writes Brig. Gen. Don Carlos Buell. Buell’s Army of the Ohio is who-knows-where and moving slowly from Nashville to Grant. Buell is being delayed by a swollen river and burned bridges. But then, something was always delaying Buell. Buell will eventually arrive, and just in the nick of time. In the meantime, there will be anxiety at Savanna and at Pittsburg Landing, but, in one of the war's great ironies, not enough. At 3 o’clock this morning, in his headquarters overlooking the Tennessee River at Savannah, Tennessee, Maj. Gen. Ulysses S. Grant writes his beloved Julia, “When you hear of another great and important strike I can’t tell you, but it will be a big lick so far as numbers are concerned. “I have no misgivings myself as to the result and you must not feel the slightest alarm. Most of his letter describes his failed strike, a few days earlier, at a Confederate railroad line. “The rain fell in torrents…and the Tennessee River rose 15 feet in one day,” he says. Sherman goes on to describe the countryside as largely deserted by its residents. “In a circuit of many miles I find houses abandoned, the people having fled, because they are told we take everything we can lay our hands on, [including] all the pretty girls…I had an old man who really believed this, and was much assured when I said if he would stay at home & mind his own business I would not permit the soldiers to disturb him..
Twenty-two miles from Pittsburg Landing on the Tennessee River, the Rebel railroad junction at Corinth (pictured above) begins receiving its first Confederate troops from Murfreesboro, part of a massive buildup to block further Union advances along the river. 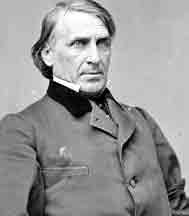 ELSEWHERE IN THE CIVIL WAR: Confederate President Jefferson Davis makes some changes in his Cabinet, most notably naming George W. Randolph of Virginia as secretary of war, succeeding Judah P. Benjamin, moved to secretary of state. However, the Confederacy will find a secretary of war to match the Union’s irascible but brilliant Edwin M. Stanton, a lawyer born and raised in Steubenville, Ohio. This is corn, not cotton country, inhabited mostly by humble white farmers scratching out bare livings from small farms. “The country here is not worth fighting for,” an Ohio soldier wrote. Nonetheless, in the form of the Tennessee River it offers a backdoor avenue into the South and Maj. Gen. Henry W. Halleck, commander of the Department of the Mississippi, is massing his forces to dominate it. While the soldiers file into their campsites, Sherman engages in some reconnaissance of the area. It is a rolling tableland about nine miles square, covered largely by forest interrupted by scattered farm fields. The area is bounded by the river on the east and by creeks on the northwest and south. This leaves a three-mile opening of sorts between the creeks, and it is in this opening that Sherman’s division is positioned. At Savannah, meanwhile, Grant is dismayed to find his forces are dangerously divided, with only two divisions at Pittsburg Landing, two at Savannah, and one at Crump’s Landing, just north of Savannah. As fast as he can, Grant begins moving the laggard divisions forward to Pittsburg Landing. Combining the troops makes good sense, but Grant’s decision will have fateful consequences nonetheless. From their position on the east bank of the river at Savannah, soldiers are being moved to the west bank at Pittsburg Landing. And it is on the west side of the river, at Corinth, Mississippi, that Confederate forces are massing at this moment. Corinth is about 22 miles by uninterrupted road from Pittsburg landing—a place history will know as Shiloh. It is Sunday and in the camps chaplains are conducting services. It was not uncommon for chaplains to accompany the troops and sometimes even join them in battle, encouraging the soldiers, performing last rites, and occasionally doing God’s work with their muskets. Chaplains received little direction from the Army, but typically busied themselves with prayer services, baptisms, and encouraging morality and temperance. Officers expected them to help build morale and maintain good order among the troops. Most chaplains were Protestants; Catholic priests were sometimes turned away by Protestant officers. Religiosity was not yet the American hallmark it would become in the 21st century, however, so many soldiers did not attend services or attend them willingly. Storm clouds are building in western Tennessee. General William Tecumseh Sherman’s division of the Tennessee River expedition, on steamboats escorted by two gunboats, has probed as far south as Eastport, Mississippi.Their objective was to tear up the track of the Memphis & Charleston Railroad, an important transportation link for the Confederacy. Streams swollen by heavy rain defeated the effort; several men drowned and artillery had to be dragged back through the bayous, with water washing over the guns. Now Sherman backtracks downriver to Savannah, where Gen. Charles F. Smith (shortly to be replaced by General Grant) had made his headquarters. Smith tells Sherman to disembark his division, and that of Gen. Stephen Hurlbut, at Pittsburg Landing, a few miles back upriver at a place called Pittsburg Landing. Sherman and Hurlbut are to position their forces “well back,” so as to leave room for still more Union divisions to come. The forces to assemble here will become known as the Army of the Tennessee. Meanwhile, Maj. Gen. Henry W. Halleck, now commander of all western forces, orders Brig. Gen. Don Carlos Buell’s Army of the Ohio to move out of Nashville and head southwest to support the forces assembling at Pittsburg Landing. Back at Fort Donelson, Maj. Gen. Ulysses S. Grant is busily issuing orders preparatory to resuming command of the Tennessee Rive r expedition. 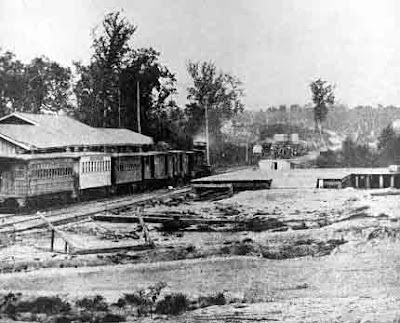 At Corinth, Mississippi, a railroad junction about 22 miles south of Pittsburg Landing, Confederate troops are massing to block any further invasion of the South. And so the stage will be set for the battle called Shiloh, a name that will stand for one of the bloodiest encounters of the war. In North Carolina, Brig. Gen. Ambrose Burnside is looking good, belying the flub-a-dub reputation he will develop later. 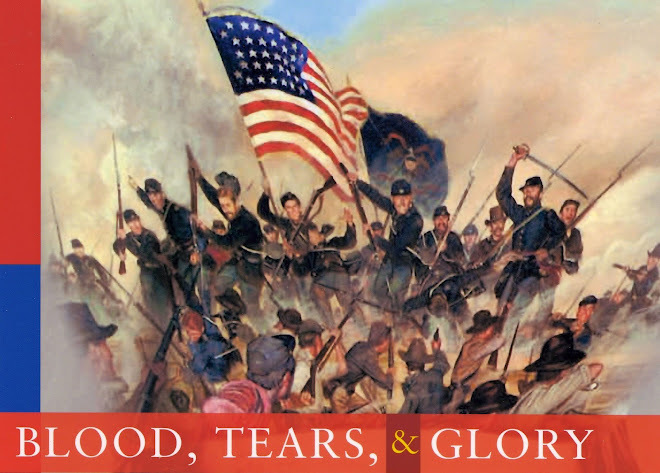 Leading 11,000 Union men over muddy roads and through the rain, he drives back 4,000 Confederates and captures the historic community of New Bern, North Carolina. New Bern is about 240 miles from the Confederate capital of Richmond, Virginia, the Union military’s destination of choice. Caught between potential threats from Burnside and McClellan (now organizing his Peninsular Campaign), is Richmond doomed? Doom looms even larger for a Confederate stronghold on the Mississippi River, 50 miles downstream from the abandoned Rebel fortress at Columbus, Kentucky, Here, at New Madrid, Missouri, and nearby Island No. 10, Confederates have installed 7,000 soldiers and numerous artillery pieces in an effort to block river traffic and stall the Union military’s drive south. Yesterday, siege guns brought up by Union Brig. Gen. John Pope pounded the daylights out of the Confederates attempting to hold New Madrid. During the night the Confederates abandoned New Madrid, fleeing to Island No. 10, and this morning Pope’s troops march into the empty town. Now Pope must figure out how to take island No. 10. These days of mid-March are heavy with the anticipation of battles to come. The military machines of North and the South are moving into position as spring beckons. Near Washington, Maj. Gen. George B. McClellan and his top commanders meet to decide whether to adopt his plan of a “peninsular campaign”—that is, a drive against the Confederate capital of Richmond from the southeast, via the Virginia Peninsula. Doubtful about the idea, President Lincoln had told McClellan to secure agreement from his generals. Although he correctly sensed the Peninsular Campaign was problematical, at this early point in the war, Lincoln still has more confidence in his generals than in his own military thinking. Not surprisingly, McClellan’s commander support him and so, with vague promises to Lincoln that enough troops would be left behind to protect Washington, the “Young Napoleon” begins implementing his great idea. Soon, camps around Washington will bustle with soldiers preparing for action. On to Richmond! In Richmond, President Jefferson Davis recalls Gen. Robert E. Lee from his south Atlantic Coast command and makes him chief military advisor, a vaguely defined position that nonetheless will lead to historic consequences for McClellan’s Peninsular Campaign. In North Carolina, meanwhile, Brig. Gen. Ambrose Burnside has landed 11,000 Union soldiers on the banks of the Neuse River and begun moving against the historic city of New Berne. This effort holds out the possibility of an attack on Richmond from yet another direction. There is skirmishing at several points in the nation, but the loudest noises arise around the Mississippi River town of New Madrid, Missouri. Here, and at the nearby Island No. 10, Confederate Gen. P. G. T. Beauregard has concentrated his forces in an effort to hold the river. An “S” curve in the river makes it a chokepoint for water traffic and an important place for the Confederates to build a stronghold. 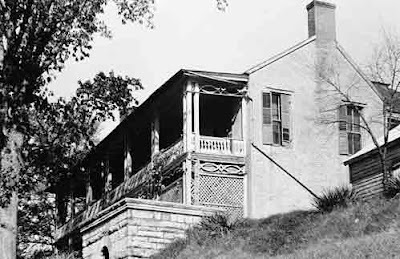 Fifty miles upriver, the previous Confederate stronghold at Columbus, Kentucky, has been abandoned and the troops transferred. About 7,000 Confederate soldiers and numerous artillery pieces await any attacker. Pope was a big-chested blowhard, but what he accomplishes here will eventually propel him into the war’s main spotlight—if only briefly. He doesn’t know it, of course, but as Brig. Gen. William Tecumseh Sherman moves up the Tennessee River, he is heading for redemption, and soon. Straight ahead lies a large, rolling area of farm fields and woods, with a convenient landing place for boats. A couple miles inland stands a small, log church. It is called Shiloh. The expedition of which Sherman is part is a huge movement of Union troops, ordered by Maj. Gen. Henry W. Halleck, with orders to sweep the river banks of Confederates and not stop until they reach Eastport, Mississippi, near the Alabama line. Later in the war and after it, Ellen will have occasion to cherish letters like this. Over the years, her efforts to bring Cump into her beloved Roman Catholic Church when he wants no part of any church will cause serious tensions in the marriage. Words like those in Cump’s letter today will become rare. Although he is back in command of soldiers, Cump's self-confidence is still shaky. He heads a division of about 9,000 soldiers, mostly “raw & green” Ohio men, but he is part of a much larger force guided by higher authorities, which is just the way he likes it. “As I have nothing to do with the plans, I feel perfectly easy,” he tells Ellen. Maj. Gen. Henry W. Halleck, Maj. Gen. Ulysses S. Grant’s immediate superior, is a desk jockey who soldiers by the book (which he wrote) and has never met a bold idea that didn’t scare him. A few days ago, he removed Grant from command of an important expedition up the Tennessee. The reasons had as much to do with Halleck’s personal ambitions and jealousies as a breakdown in communication (which was not Grant’s fault). 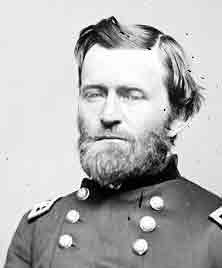 Today, however, Grant has learned that Halleck will be sending him more troops for the Tennessee River expedition and that Grant should "be ready...to take the general command." Grant's time in purgatory is over. The troubles began with Halleck’s desire to take overall command of western forces instead of dividing them, awkwardly, with Brig. Gen. Don Carlos Buell. Halleck based his appeal to Washington on his claim of the Fort Donelson victory, although the credit properly belonged to Grant. When a disloyal telegrapher disrupted communications between Grant and Halleck, the latter used the situation to remove Grant from command of the Tennessee River expedition. On March 11, however, President Lincoln formally issues his General War Order No. 3. In the West, departments are consolidated under Halleck, just as he wished. In the East, Maj. Gen. George George B. McClellan is relieved of overall command of Union forces, ostensibly so the slow-footed McClellan can concentrate his energies on moving the Army of the Potomac against the Confederate capital of Richmond. For the time being, no general-in-chief is appointed. In western Virginia, a new Mountain Department is created under the problematical but politically powerful John Charles Fremont. So Halleck has what he wanted and, moreover, President Lincoln is asking for proof of Grant’s alleged dereliction of duty (of which there is none). That could be embarrassing--to Halleck--so he folds his cards and moves on. Thus, Grant regains the position that never should have been taken away from him. And once again we learn how politics, jealousy, and personal ambition are so often part of the story in the conduct of war. ELSEWHERE IN THE CIVIL WAR: Jefferson Davis, president of the Confederacy, refuses to accept the reports of Generals Floyd and Pillow, who cravenly fled Fort Donelson before its surrender. They are relieved from duty, as well they should be. Maj. Gen. Ulysses S. Grant doesn’t realize it yet, but his removal from active command by his jealous, self-seeking superior, Maj. Gen. Henry W. Halleck, is about to end. Halleck is getting what he wanted from Washington, so today he composes a telegram to Grant. Unaware of the machinations and jockeying going on at higher levels, Grant busies himself on the sidelines at Fort Henry. He is limited to forwarding troops and supplies to the Tennessee River expedition he was originally supposed to lead but, it will be a sunnier day for Grant tomorrow. Elsewhere in the Western Theater of the war, soldiers take time out from their duties to write home. It‘s a big day in the history of naval warfare: the meeting at Hampton Roads, Virginia, of the two most unusual naval vessels on earth, the Confederacy’s Virginia and the Union’s M onitor. The C.S.S. Virginia (known to history as the Merrimack) is a strange-looking, iron-plated, wooden-hulled warship mounting ten guns. The ship mounts one gun in the bow, another in the stern, and four on each side, and it also is equipped with a ram. Four inches of iron and 24 inches oak armor the vessel. The destroyer yesterday of many wooden vessels of the Federal navy at Hampton Roads, it sallies forth from its Norfolk anchorage to do more damage, only to meet…not more wooden-hulled victims, but the U.S. Monitor. Monitor is the Union’s “secret weapon”—another strange-looking warship, a small, low-riding vessel built entirely of iron, with a rotating turret mounting two powerful cannon. The deck is only a few inches above the waterline and the turret has nine layers of iron armor. 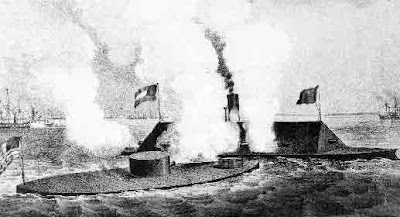 The vessel is nicknamed “the cheese box on a raft.” Can its two guns and small target defeat the floating battery of artillery thatias the Virginia? Or will the Virginia pound the Union vessel into chunks of iron? ELSEWHERE IN THE CIVIL WAR: In his diminished role at Fort Henry, Grant continues to organize support for the Tennessee River expedition he originally was to command. One of the expedition’s division commanders, William Tecumseh Sherman, has embarked from Paducah at the head of his troops, restored to active command. In Arkansas, Earl Van Dorn is scrambling to re-assemble his routed Confederate army, humiliated at Pea Ridge. 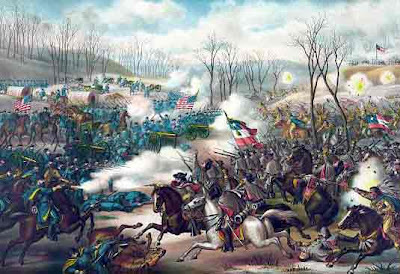 After yesterday’s opening battle, the struggle resumes at Pea Ridge between Van Dorn’s 16,000 Confederates and Curtis’s 11,500 Federals. The fight is concentrated near Elkhorn Tavern on the Union right. Once again, the artillerists—among them, two Ohio batteries—play a decisive role, smashing Confederate batteries that lack sufficent shot and shell to fight back effectively. Van Dorn’s “clever” plan to attack the Union rear has backfired on him, for he has cut himself off from his ammunition wagons. Finally, a charge by 7,000 Federals led by Franz Sigel’s German-American regiments from Illinois and Indiana routs the Confederates, who flee in disarray. The outnumbered Union soldiers scatter the Southerners, and it will take Van Dorn two weeks to reassemble his forces. This delay will prevent Van Dorn from bringing reinforcements to Albert Sidney Johnston in time to make a difference at a place called Shiloh. 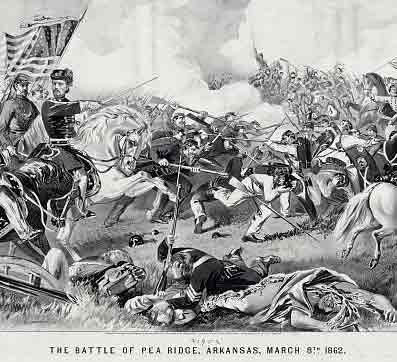 Pea Ridge is the biggest battle won during the Civil War by outnumbered Northern forces. Curtis’s Federals suffered 1,349 causalities, most of them killed or wounded; the Confederates, 4,600, most of them captured. On the same day, Halleck wires McClellan, “Strange to say I have not yet received any returns whatever from Grant….” Halleck is determined to give Grant no breaks. Grant will make no further argument for several days. ELSEWHERE IN THE CIVIL WAR: The C.S.S. Virginia, an up-armored steamship known to Northerners as the Merrimack, steams into the Union Navy anchorage at Hampton Roads and plays havoc, sinking or running aground several of the old-fashioned wooden vessels. As the Confederate vessel returns to home port, expecting to come backthe next day, the Union’s new iron-clad fighting ship, the Monitor, is wallowing its way to Hampton Roads. Soon, there will be a new kind of naval battle. In Washington, President Lincoln confers with General McClellan, back from his useless expedition to Manassas. Reluctantly, Lincoln approves McClellan’s plan to attack Richmond from the South, so long as he leaves enough troops to defend Washington. Union forces east of the Mississippi are busy preparing for battles yet to come, but the war’s biggest battle west of the Mississippi begins this cold, misty morning in northern Arkansas. Confederate Maj. Gen. Earl Van Dorn, a battle-scarred, hard-bitten Indian fighter, has patched together an army of 16,000, including three regiments of Indians and has fighting on his mind. Crying “I must have St. Louis—then Huzza!” Van Dorn hopes to blast through a Union army blocking his way, then invade Missouri. Most Confederate forces have been driven from Missouri, a “border state” which the Confederacy claims as one of its 13 members—although it will never officially leave the Union. Attacking on the left, the Confederates are hurt badly, with artillery fire breaking up their three Indian regiments. Most of Curtis’s infantrymen are from Missouri, Illinois, and Indiana, but among his artillerists are two batteries from Ohio, the Second Independent Battery and the Fourth Independent. The Ohio artillerists play important roles during the two days of battle. On the right, heavily outnumbered Union troops give ground slowly, concentrating the fighting around Elkhorn Tavern. It is here, tomorrow morning, that fighting will resume and decide the battle. MEANWHILE, ON THE TENNESSEE RIVER: Steamboats carrying an attack force under the command of C. F. Smith chug up the river. The erstwhile commander, Maj. Gen. Ulysses S. Grant cools his heels at Fort Henry by order of Henry W. Halleck, commander of the department of the Missouri. Grant’s invasion of Tennessee, with his swift capture of Forts Henry and Donelson, were so promising they made him America’s hero of the hour. Within days, his immediate superior has moved to disgrace him. What will become of Ulysses S. Grant? ELSEWHERE IN THE CIVIL WAR: After months of going nowhere, Maj. Gen. George B. McClellan’s well-trained and equipped Army of the Potomac, gets moving, heading for Manassas, Virginia, about 30 miles from the nation’s capital. Bystanders, hoping for redemption after the debacle last July near Manassas, are impressed by McClellan’s army, marching in perfect ranks and columns, flags snapping in the breeze, sunlight glinting off bayonets and metal buttons. But the wily Confederate commander at Manassas, Gen. Joseph E. Johnston, knows McClellan’s overwhelming forces are headed his way and slips away, to fight elsewhere another day. McClellan will arrive at the abandoned fortifications to discover evidence—including so-called “Quaker guns” (fake cannon)—that the enemy forces camped there were far smaller than McClellan had been claiming. The “fancied impregnability” of the Confederate position was found to be a “sham,” a reporter wrote. In the Shenandoah Valley of Virginia, Union commander Nathaniel Banks’ advance units skirmish with Thomas J. “Stonewall” Jackson’s defenders. The only known causalities are three wounded on the Union side. Jackson is backpedaling for now, but will begin bamboozling the hapless Banks soon enough. 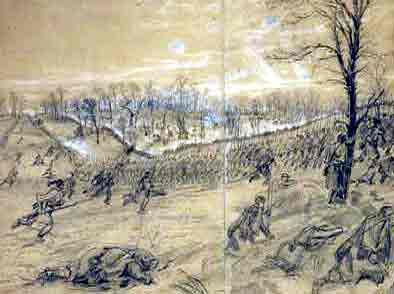 Across Missouri, as winter weather begins to moderate, numerous small skirmishes break out between Union soldiers and Confederate guerrillas. Confederate regulars already have been driven out of the state, so the actions are more a nuisance than a threat.